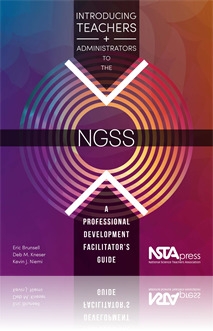 Introducing Teachers + Administrators to the NGSS by Brunsell, Kneser, and Niemi does a phenomenal job of building NGSS comprehension by providing 24 lessons ranging from an introduction to NGSS to building a model curriculum based on the NGSS standards. Because the introduction of new standards can produce anxiety, the manual encourages the reader to integrate what they are learning as they progress towards teaching to the NGSS standards. The manual is meant to be read, discussed, and worked through completely in roughly 30 hours. Before the NGSS is utilized in any school or school district, this manual should be introduced to both the teachers and district administration to be sure that all understand the benefits of the NGSS framework. I am always cautious when recommending one of NSTA’s own books because as an active member myself, there is always the potential accusation of nepotism; and so to me, it is very important that an NSTA Press book truly stand out as exceptional. This book is such a book and is an invaluable resource for anyone seeking to promote constructive dialogue in their schools about how to implement the Next Generation Science Standards (NGSS) successfully. ... What sets this book apart for me is the quality of the way the activities are provided to the potential user. ... The value of this book is such that I am already planning on using three of its activities with the teachers in my K–12 department this August—and I can’t think of a higher recommendation than that. 5 Great Resource for Facilitators!